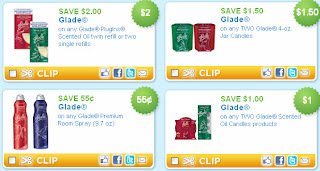 4 New Glade Coupons + GREAT Target Scenario! = $3.95 for all 5 products, or $0.79 each! NOTE: There will also be a regional coupon in this Sunday’s newspaper for a $5.00 gift card at Target when you buy 5 qualifying SC Johnson items, which are the products above! Thanks, Stingy Momma and The Krazy Coupon Lady!